Considered as one of his most controversial artworks today, the infamous piece, ‘Erased De Kooning’ ventured away from Robert Rauschenberg’s usual practice. As a nervous 27 year old, Rauschenberg approached William de Kooning, who was already a prolific artist at the time, and asked to be given one of de Kooning’s work. This would not have been a surprising request had it not been for Rauschenberg’s intentions for the piece. He wanted to erase it. Though hesitant, de Kooning eventually gave in and handed the young Rauschenberg an old sketch covered in charcoal, pencil and ink; a piece that he would miss. After two months and many erasures, the work was reduced to a mere blank sheet with suggestions and smudges of a drawing that once was. To this day, ‘Erased de Kooning’ is popularly known by its current state, which is, basically an erased drawing. However, to reach that stage it required not one but two artists. 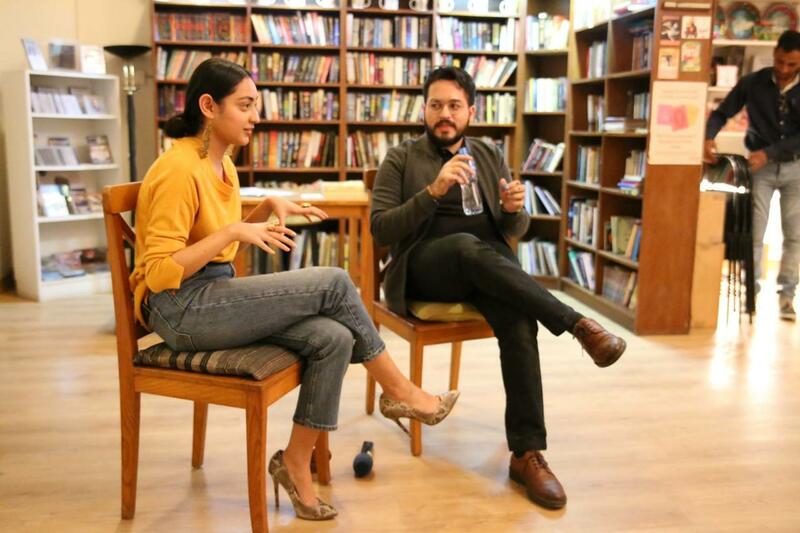 Though not initially intended, the piece may be considered an artist collaboration of sorts, where one artist works upon another’s piece to create a novel piece as a result. Similarly over the centuries, various collaborations have emerged throughout the art world. Andy Warhol produced a series of paintings upon which, Jean-Michel Basquiat painted his effervescent charm and emotion, an addition that multiplied Warhol’s work tenfold. A collaborative artwork emerges as a visual conversation between the two artists, as they speak in perfect harmony through the medium. In a similar way, a recent exhibition at the Faraar Gallery, T2f, displayed a collaborative body of work between two emerging artists. 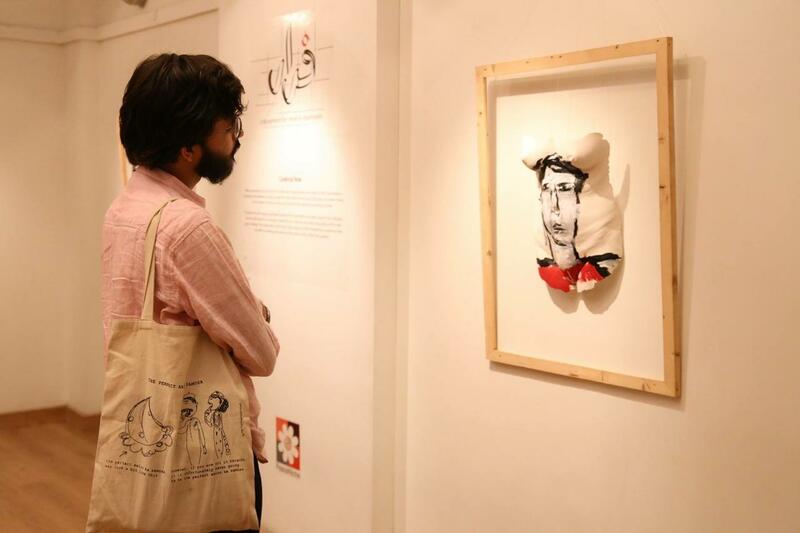 Asad Kamran and Misha Japanwala worked in unison to present a series of works titled ‘Gaze’. The worked delved into the dynamics of male-female encounters particularly in Pakistan, though their findings could very well be understood universally. What began as a discussion of their agencies as artists in a socially and politically bubbling country, led the artists to explore their hometown through the guise of each one’s gender, that is, through the eyes of the female and male. Kamran describes his journey as a male thus far, as one of relative freedom and privilege. Japanwala on the other hand, as almost all women, is forced to experience the world differently; behind a veil (real or figurative) of limitation and subjugation. 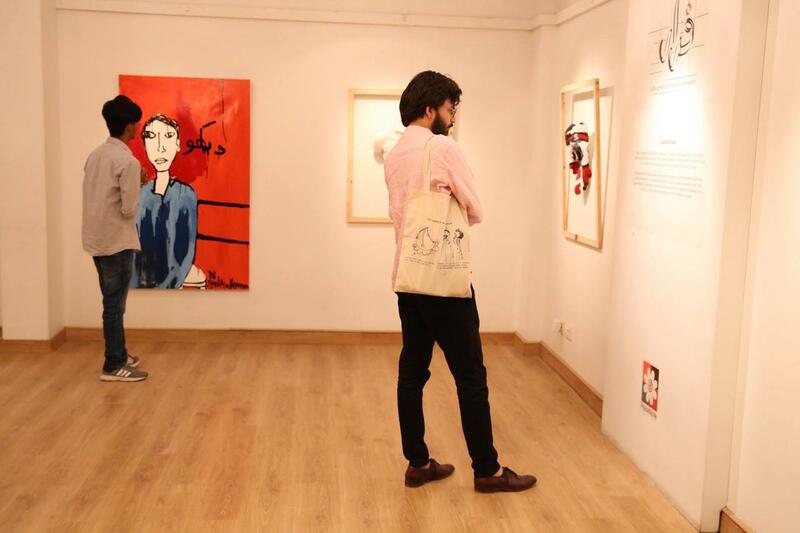 The exhibition not only presented a collaboration of thoughts and styles from the two artist but also a juxtaposition of multiple mediums which included Kamran’s painting and Japanwala’s sculptures. Japanwala’s series ‘Azaadi’, consists of several sculptural casts moulded from the Pakistani female form. The series is a depiction of the strength of Pakistani women and their resilience amidst the unbearable realities of hardships, torture and even death. The hollow casts themselves, are life-size and also very much life-like. With supple form and attention to minute detailing, the work is almost perfectly representative to a woman’s bare body. On its own, the artist’s sculptures stand firm and powerful, unashamed of their natural beauty and unapologetically vivacious. However, once smeared with the strong and iconic strokes of Kamran, each form seems to stunt and shun itself away. 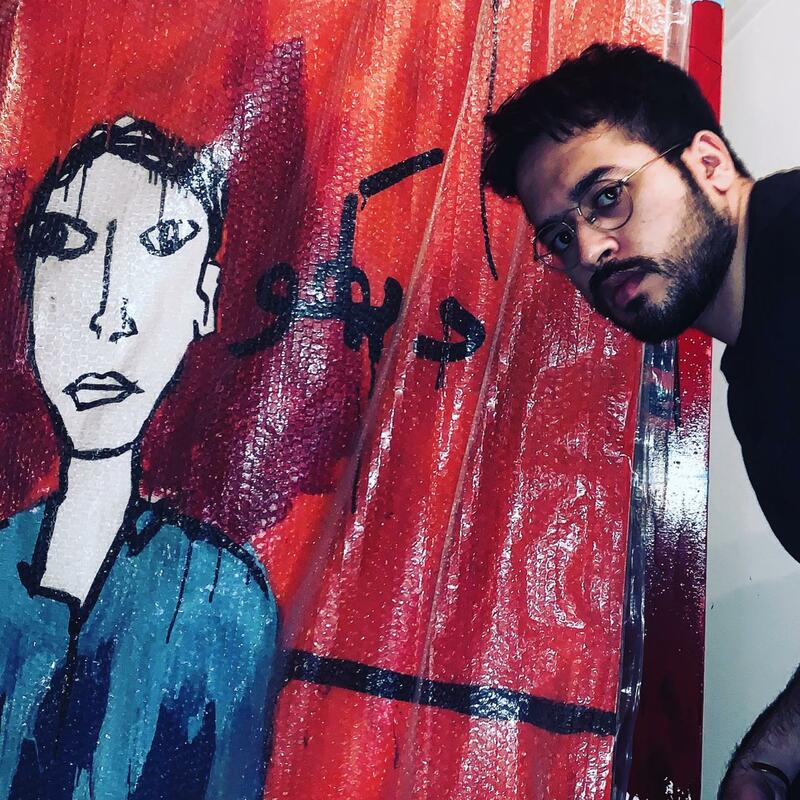 Through the process of painting the body, the male artist, Kamran, does what men in this society do; he covers the female as an excuse to protect from the vicious gaze of others. However, through this act of supposed protection, the woman is eventually hidden entirely, separated from the idea that she too is equal to the man and therefore, deserves equal respect. The veil/ covering eliminates the woman and her capabilities leading to constant oppression and harassment. The paintings themselves are also of the male face, staring back at the audience as they are placed on the breasts and other intimate parts of the female body. 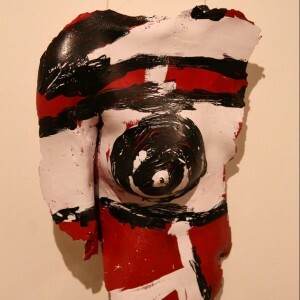 The artworks touch upon the idea of the ‘Male Gaze’ which is a term used to describe the sexual objectification of women through the male’s perspective. The works are reminiscent of other famous artists such as Barbara Kruger and Shireen Neshat. Both artists explore the plight of the female as they struggle under persecution and the male gaze. 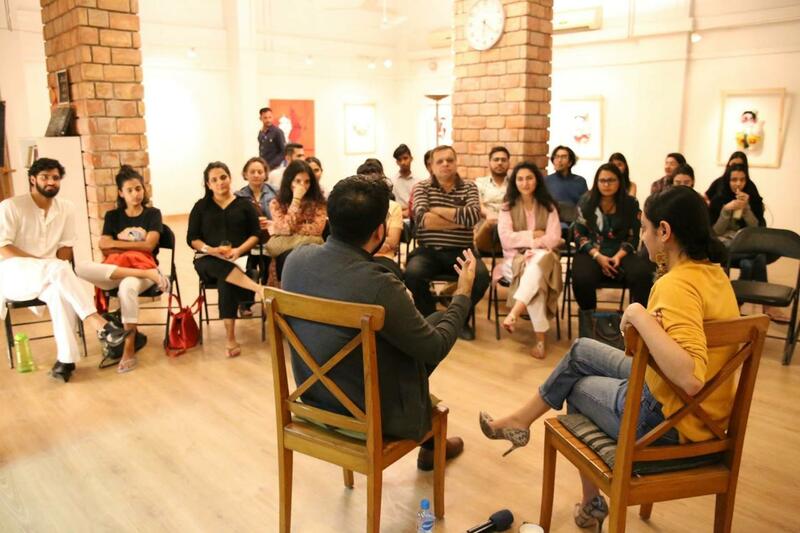 Japanwala and Kamran, though emerging talents, understand their roles in society and how gender directly affects it. By allowing each other to showcase themselves with such vulnerability and truthfulness, they provide a just recollection of the everyday life in Pakistan. It should be noted that there is a constant struggle, not only in this country but worldwide, to eliminate this prejudice and significant progress can be seen. However, artwork like that shown in this exhibition presents a reminder to all; achieving equality is still a long way ahead.